A national memorial service for victims of the Grenfell Tower fire will be held at St Paul's Cathedral. The service will focus on providing messages of support for the bereaved and on offering strength and hope for the future for those of all faiths and none. It will take place on 14 December - exactly six months after the fire. 1,500 free tickets for the service will be offered to people in North Kensington. Representatives will also be invited from a wide range of local faith and cultural groups. The local community is being encouraged to suggest ideas for the service to the Chapter of St Paul's Cathedral. 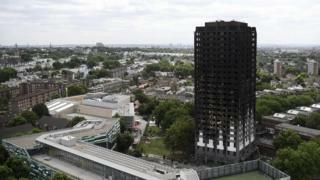 Shahin Sadafi, chair of Grenfell United, said: "Nothing significant has yet changed for the bereaved families and survivors of the fire. "However, we hope that by gathering together to remember the tragedy, we can begin to heal our community with the support of the whole country."